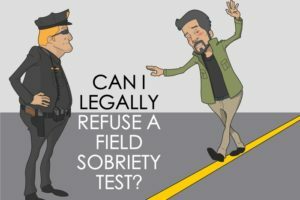 May I Legally Refuse Field Sobriety Tests if Stopped for DWI? Home » NEWS » May I Legally Refuse Field Sobriety Tests if Stopped for DWI? Yes. You may legally refuse field sobriety tests in Texas. This article explains why you should consider refusing. If the officer sees enough to warrant a further investigation, they will ask the driver to step out of the car. Once the driver steps out of the car, the officer will typically position them in front of the squad car so that the dash cam can capture the interaction (to be used later at trial if needed). The officer will then explain that they are going to do some tests just to “make sure that you’re okay to drive.” Note: The officer WILL NOT ask permission to conduct the field sobriety tasks. He will jump right in and hope that you just go along with it. There are 3 standard tests that are explained in more detail on our DWI page. The One Leg Stand test is also difficult for a sober person to maintain for 30 seconds and if the person puts their foot down at 27 seconds it is a strike against them. Throughout the years, the tests have been debunked and challenged by experts as unreliable, but the courts are still allowing them as proof of intoxication (the loss of mental or physical faculties). In short, the tests set you up to fail. So why would a driver who is suspected of DWI take the tests if they didn’t have to? Even though the officer might act as if you must take the tests, you don’t. If he asks you to exit the vehicle then you must get out of the car. But as soon as he tries to start the HGN (eye test) on you, you can (and probably should) politely refuse to take the test. Take note of what I said…Politely Refuse. Do not be a jerk about it and go into a diatribe about how you read this blog and you know these test are no good and that you will not do them. Remember this is all being captured on audio and video; audio and video that will be exhibit #1 at a trial if it goes that far. Simply inform the officer that you do not wish to participate in the field sobriety tests. Can I Still be Arrested if I Refuse to Perform the Field Sobriety Tests? Yes you can (and probably will) be arrested if you refuse to perform the FSTs. If the officer already felt like he had enough evidence to administer the tests, then he will probably go ahead and arrest you for DWI if you refuse to take them. But hey, you were probably going to get arrested anyway. Now, however, there will be less evidence against you. You have an absolute right not to give evidence against yourself. This constitutional right applies equally in the DWI context. Should I Take the Tests if I Haven’t Had that Much to Drink? We have seen each of these scenarios on actual DWI videos. We hope you will listen to our advice regarding DWI field sobriety tests. Better yet, we hope that you’ll just pay the $40 for an Uber or taxi from the bar or restaurant and avoid this altogether. But if you didn’t take our advice and you didn’t call and Uber, call us and we’ll be happy to be your advocates. *This article did not discuss whether you may legally refuse a Breath Test or a Blood Test. We’ve written on that many times and the answer is YES. You may refuse breath and blood tests UNLESS the officer has a warrant for your blood. If they have a warrant, you may not refuse.